Vanessa Till Hooper's latest installation engages travelers through technology. By Helen Wolt. Vanessa Till Hooper is on the leading edge of art and technology. The Boston-based artist combines her talent for art with training as an architect and high-tech skills to create interactive artwork. Hooper’s latest project is a light wall that fuses technology and the internet to put viewers in control. 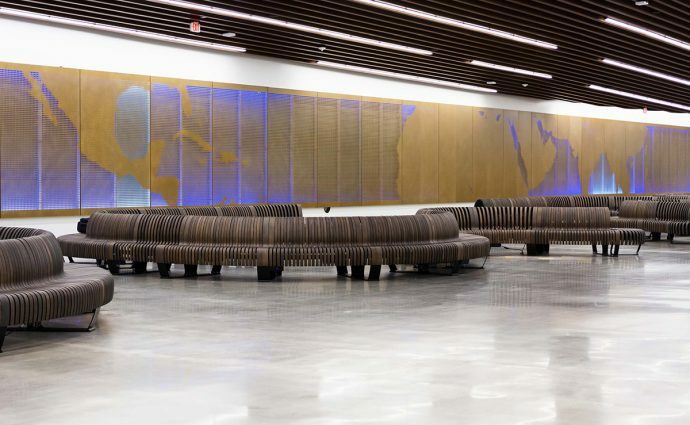 Titled Visual Voyage, the installation is tailored for travelers in Port Everglades Cruise Terminal 25, which is the winter homeport for Celebrity Cruises’ new ship Celebrity Edge. Visual Voyage features a stylized map that continues along the equator. 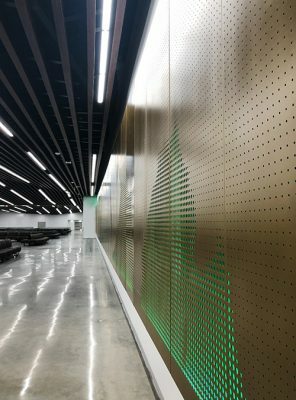 It stretches across two large sections of wall in the cruise terminal’s check-in hall covering about 298-feet with 10-foot tall panels. Colorful LED lighting illuminates the panels. Passengers waiting to embark on a cruise can connect via smart phone to send the lights racing across the map. Broward Cultural Division’s Public Art & Design committee commissioned the artwork. Port Everglades Assistant Director Peg Buchan said Hooper’s artwork stood out for its “youthful generational appeal” that relates to travel and prompts visitor participation. “Port Everglades was excited by the concept of a modernistic art creation. Hooper’s work complemented the fresh contemporary vibe of Cruise Terminal 25 and—much like cruising aboard the Celebrity EDGE—the artwork seems to exemplify a new era,” Buchan continued. As the installation’s finishing touches were completed this November, Hooper took the time to talk about her lifelong exploration of art. What was your inspiration for Visual Voyage? 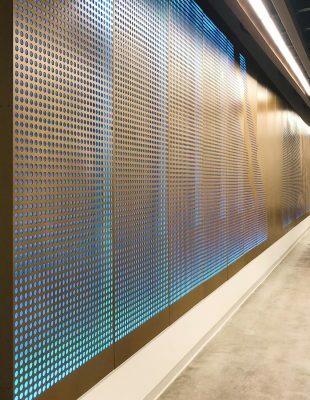 How does the interactive light wall work? “On the Port’s website [passengers will access the light wall in the terminal via their mobile devices], when you interact with the installation by pressing a button that says EAST or WEST you can move the sun’s light in that direction. 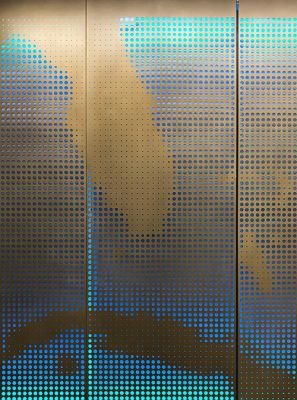 Each two panels of the installation represent one segment of the 24-hour clock of the globe. Then you send the light—one hour at a time—all the way to one. How long does it take for the light to traverse the map? What impression do you hope Visual Voyage will impart to viewers? “It should be delightful. It should be visually appealing and add richness to the environment but at the same time be playful and engaging. It should inspire visitors to the terminal to think about their voyage in a new way, and to muse about the global map and imagine where they might go next. The check-in hall is approximately the length of a football field. How did its size impact the design? Do you have a strong background in technology? “I have developed one somewhat reluctantly, I love the flexibility and fluidity of using technology to enhance human experience, so I’ve had to learn quickly. What led you to specialize in interactive art? What other interactive projects have you completed? How is Visual Voyage unique from your other public artworks? For further information about the Cultural Division’s Public Art & Design program and more public art projects at Port Everglades, visit PublicArt.Broward.org.